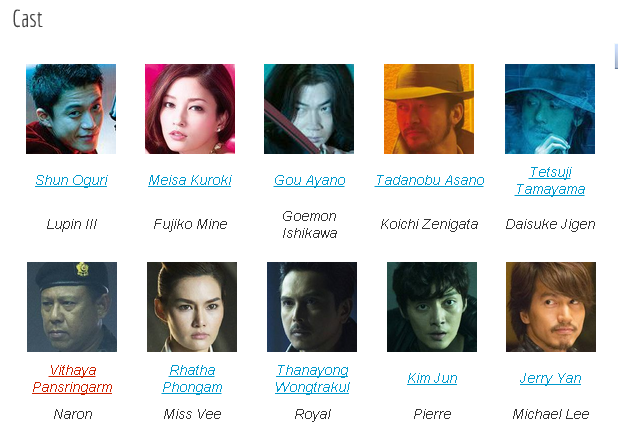 Lupin III (Shun Oguri), Daisuke Jigen (Tetsuji Tamayama), Ishikawa Goemon (Gou Ayano), Fujiko Mine (Meisa Kuroki) and Inspector Koichi Zenigata (Tadanobu Asano) meet. They face a powerful enemy and form the Lupin team in response. The Lupin team then faces the challenge of retrieving the “Crimson Heart of Cleopatra” locked away in a fort like safe. The treasure is thought to allow its owner to control the world. Based on the manga series “Lupin Sansei” by Monkey Punch (published August 10, 1967 to May 22, 1969 by Weekly Manga Action). Filming began October 3, 2013 and will take place in Japan, Thailand, Hong Kong, Singapore & Philippines. Filming finished December 26, 2013. 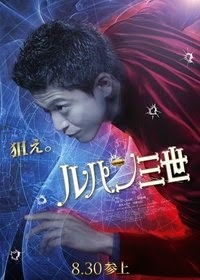 To play Lupin III, Shun Oguri went through 10 months of action training and lost 8 kg. Actor Gou Ayano gained 10 kg to play the character of Ishikawa Goemon.